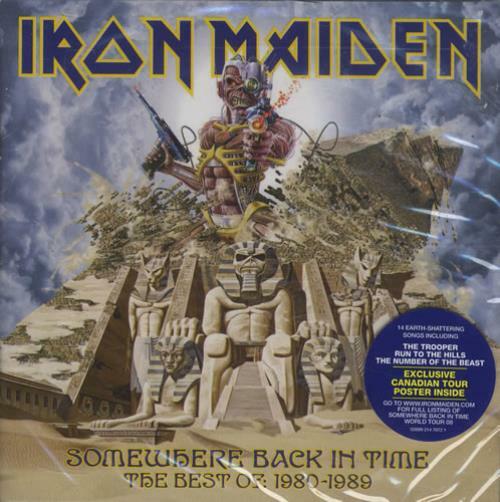 IRON MAIDEN Somewhere Back In Time: The Best Of 1980-1989 (2008 Canadian only Limited Edition 15-track Greatest Hits CD album, compiling the best work from the legendary rockers originally released between 1980 and '89, includes the classics 'The Number of The Beast', 'Run To The Hills', 'The Evil That Men Do' plus 3 live recordings. STILL SEALED FROM NEW and COMPLETE with both its exclusive Canadian Tour poster AND promotional-only, custom Eddie iPod Skin. This is arguablythemost coveted, official Maiden release of 2008, as only 500 were available to buy on May 13, 2008 upon the album's official Canadian release date! ).